Irene has visited and departed. A loud and messy guest, we were happy to see her go. Although she was gentler with us than others she visited, we still have a fair amount of cleaning up and catching up. Interestingly Irene also brought a sort of reverie which often accompanies a period of focused attention. 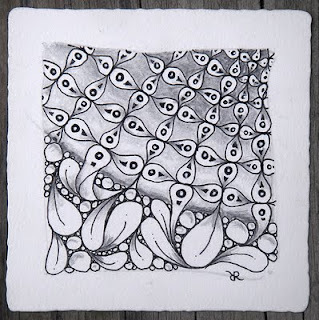 Maria expressed that storm induced reverie on this Zentangle tile . . .
. . . and Raphaël Enthoven, captured a bit of reverie in words in this piece which was translated from the French by Betsy Wing and published in the NY Times. 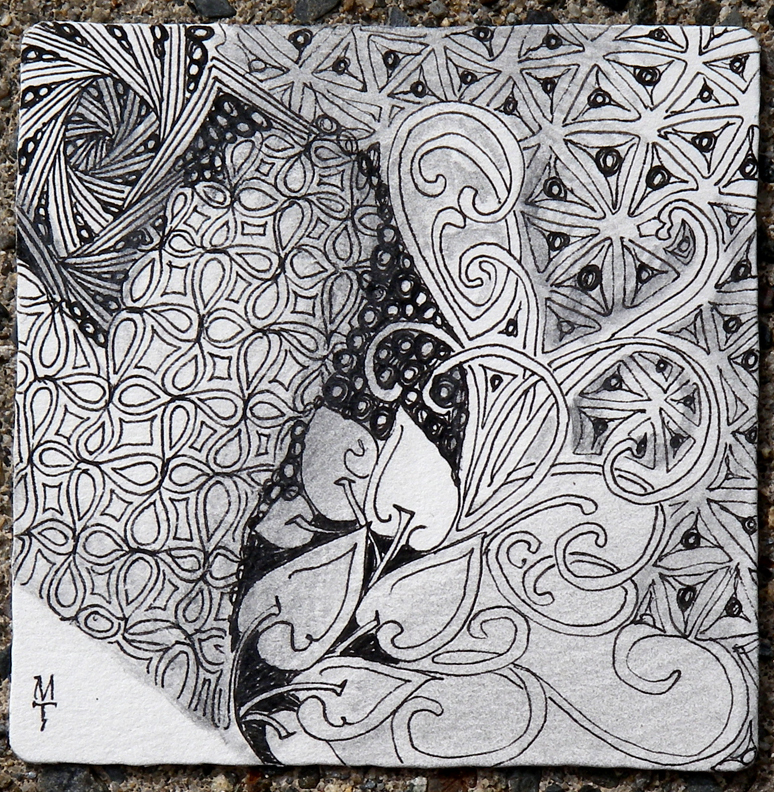 "Reverie" is one of our favorite words for it comes closest to describing that state of relaxed focus which often occurs while creating Zentangle art. 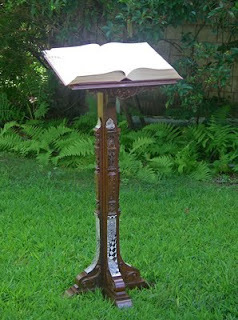 Karen Woodbine, CZT, [blog] forwarded this link to us and we are grateful that she did. This article is a feast. Set aside some time to savor it without interruption.
. . . reverie celebrates the rediscovery of understanding and imagination, sets free the secret of disinterest which, because it lets you see beauty without your consent and see nature without ego, invests the world with intense interest. 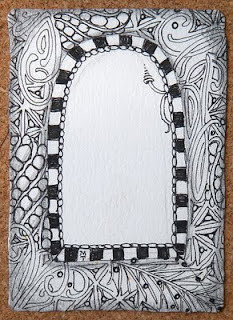 Previously, we would use six words to describe what we do in our Zentangle work. Now, we use three.
. . . is for A new friend we made this weekend. Click image for larger view of how grateful we are. So nice to have these challenges . . . a reason to try something you hadn't thought of or do something you haven't done in a long while. 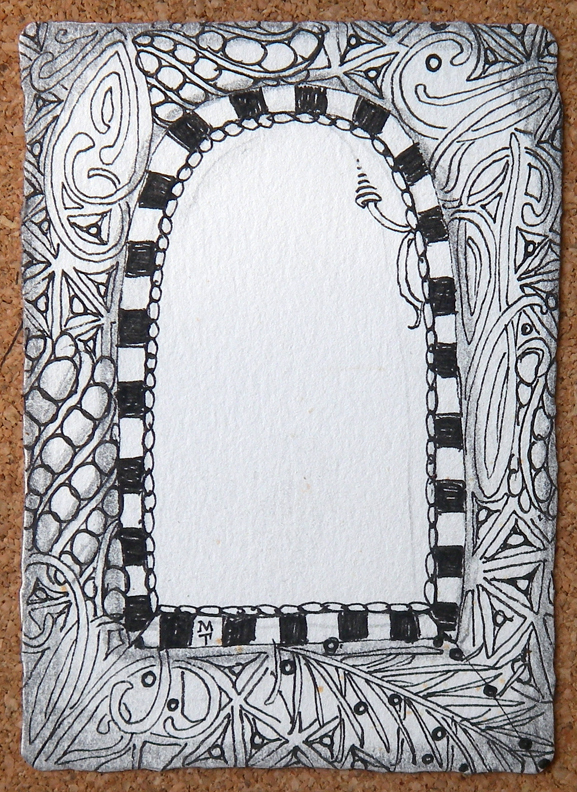 I wanted to keep this one simple, but my middle-of-the-night sleeplessness wouldn't let me. 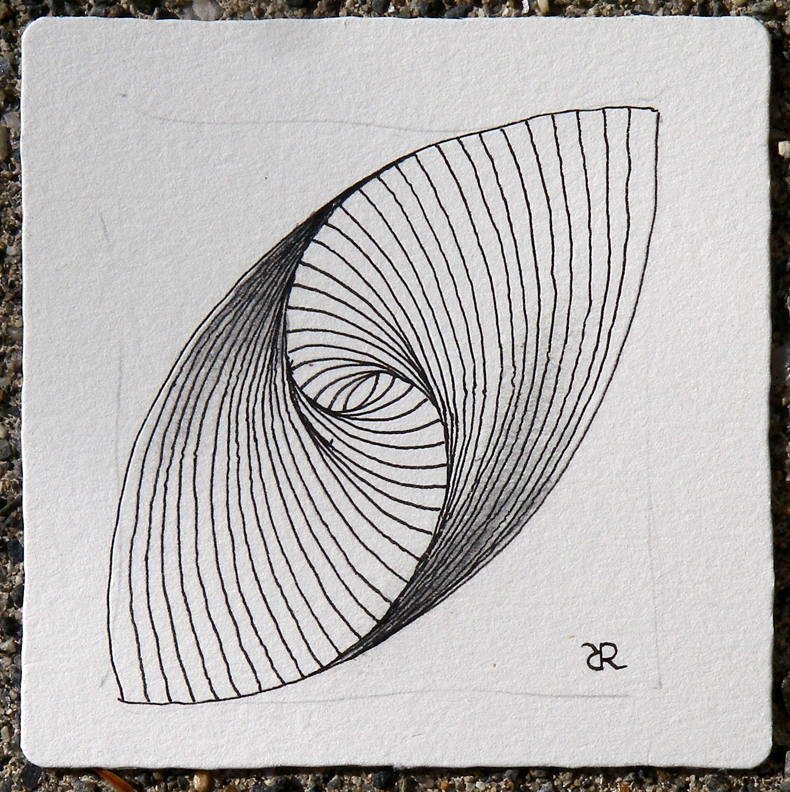 My first three appeared too complex, too contrived, too "drawn." Then I did this one . 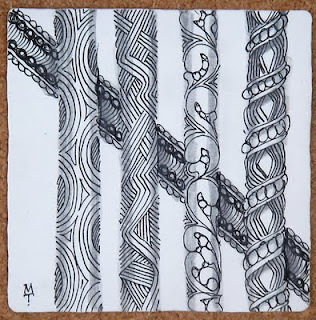 . . a mix of new and old tangles. And it really is true what many of our emails say . . . 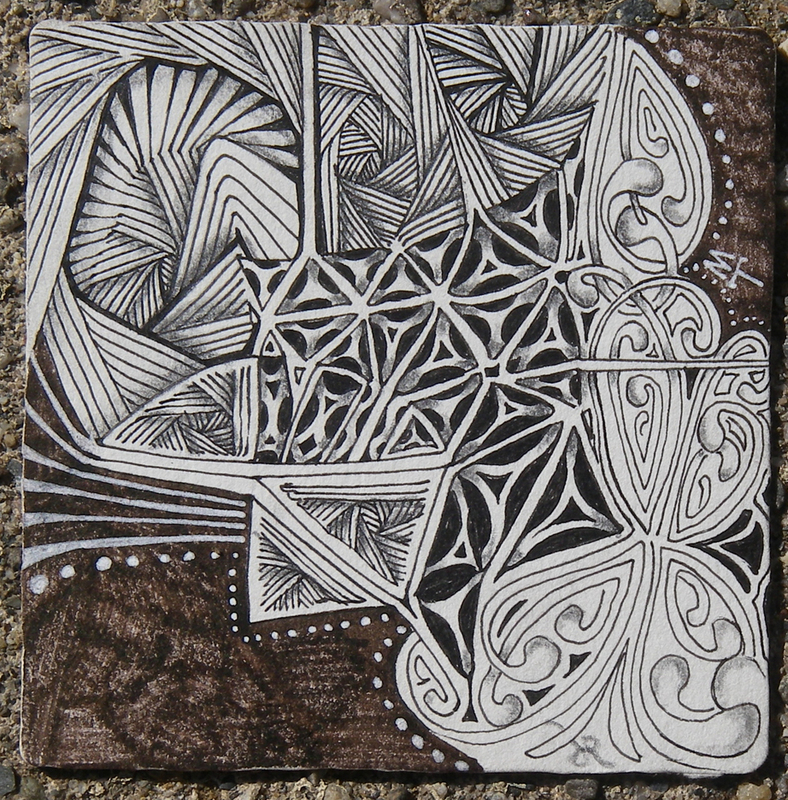 I slept great after creating that Zentangle tile in the middle of the night! We received this email from "ML" this morning. What a lovely new tangle I found in the newsletter. 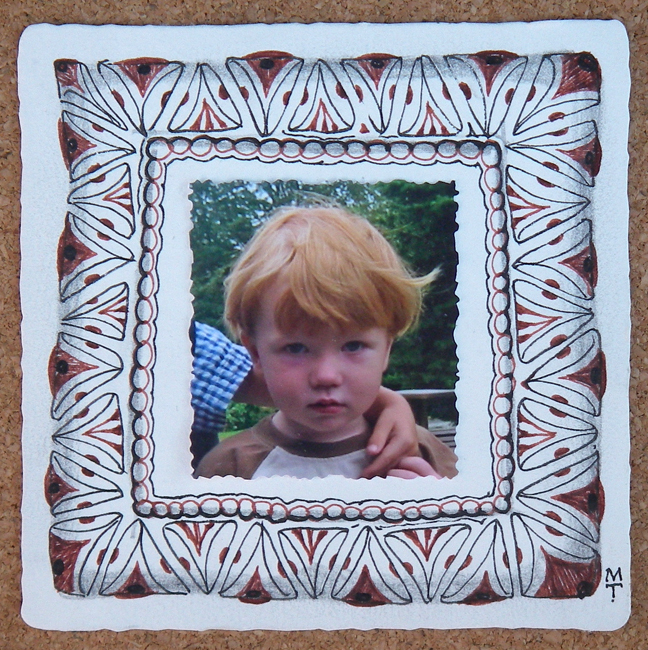 I have been experimenting Assunta, and I like to show you what I did with it. It’s very inspiring to work with this tangle. 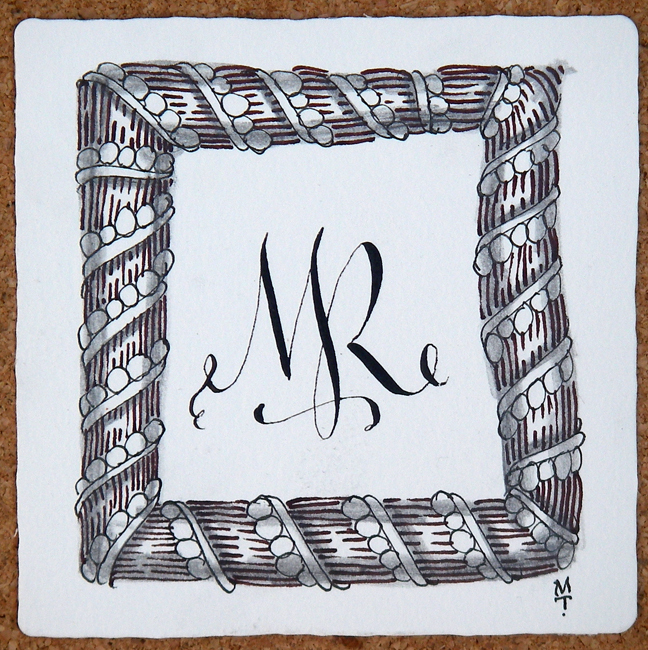 Those are some fun and creative tangleations* of assunta, ML. Thank you so much for sending that inspiring email for all of us to enjoy. 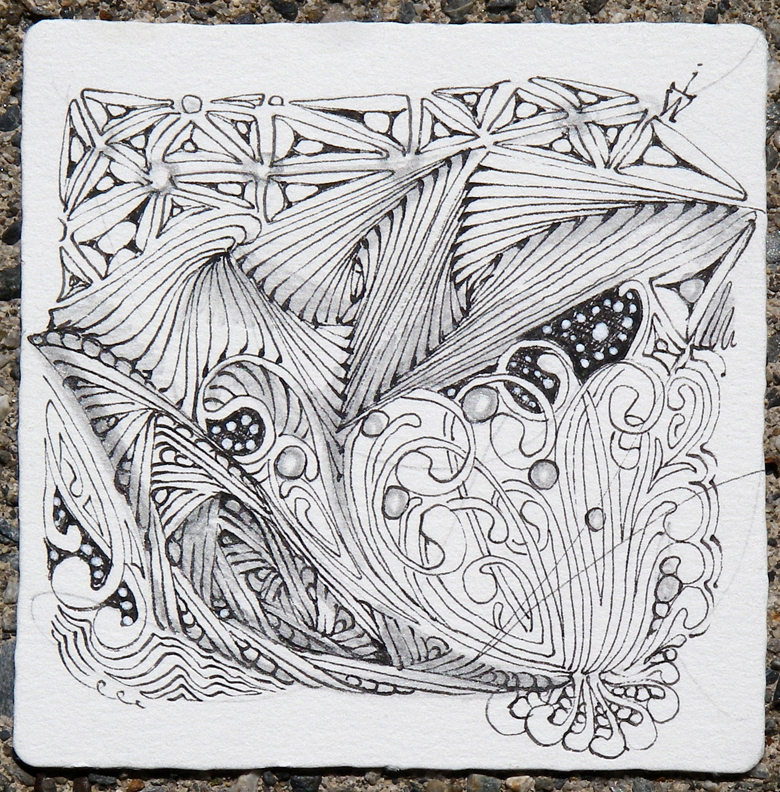 It is such a thrill for us to see the many unanticipated and beautiful directions you all explore with these tangles. 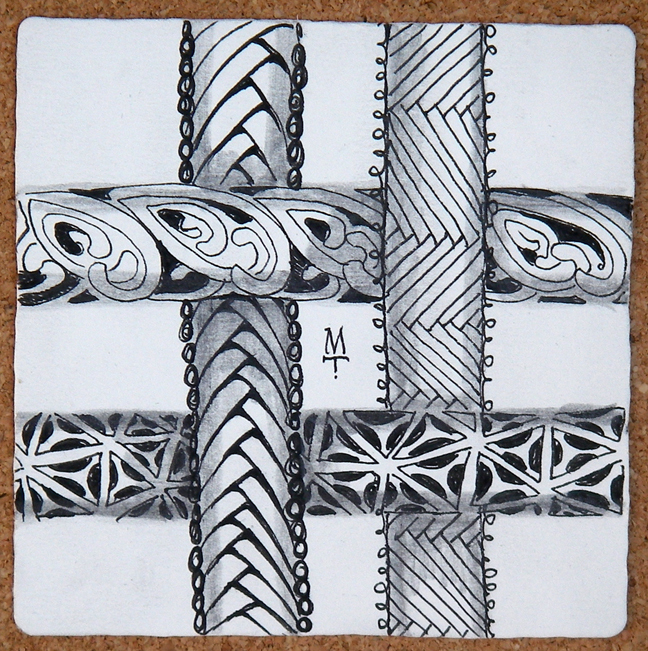 *Tangleation: Tangle variation, most often in combination with another tangle. Maria replies to yesterday's blog . . . 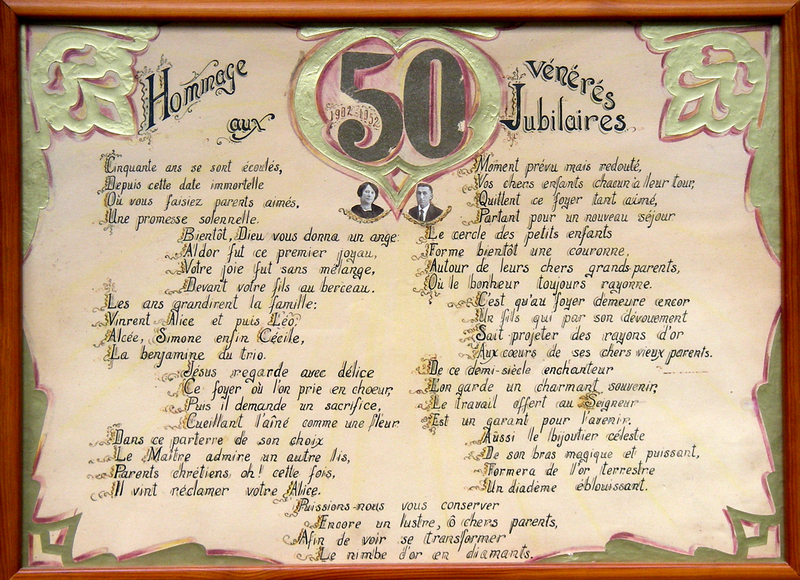 Although I may not have inherited all of my aunt's noble traits, she was an artist, untrained but passionate, and her focus was on lettering. 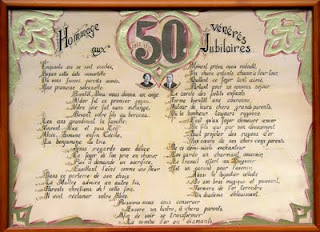 I had never heard the word calligraphy as a child, but I loved her "fancy writing." I remember studying this piece for long bits of time when I was 4 or 5 years old and marveling at its beauty. It now hangs in my studio. 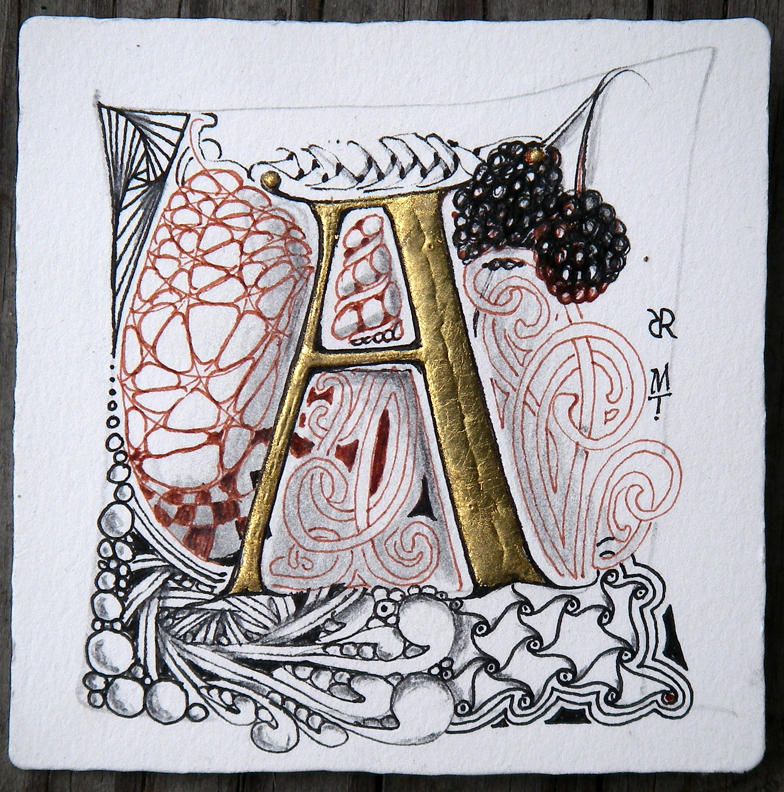 My aunt was not, by today's standards, a very good calligrapher . . . but her work pushed me to be the artist I am. So here's to my Aunt Alice (Sister Maria Fidelis) who died in her late 90's many years ago. What was her most profound message to me? That you do not have to be a great artist to be great. And that you do not have to be a great artist to inspire others to want to create art . . . to inspire in someone the idea that they can create art. 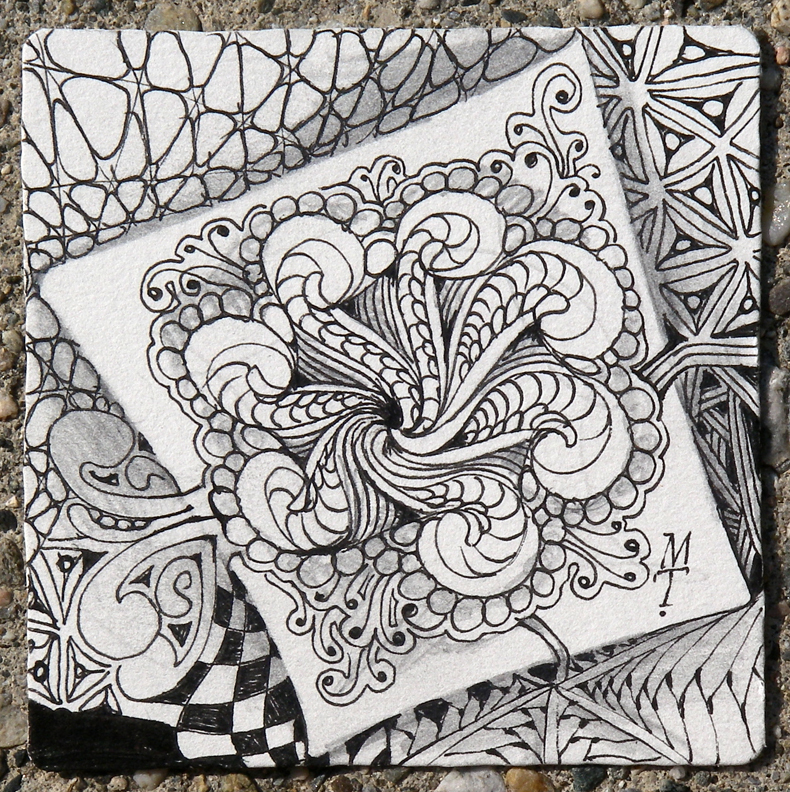 Who will come across one of your Zentangle tiles and become inspired to do great things? 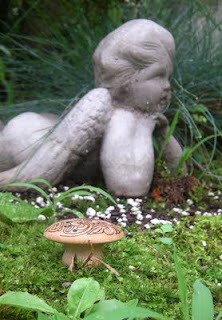 This blog, with its larger images and a place for comments, is a companion to this newsletter. 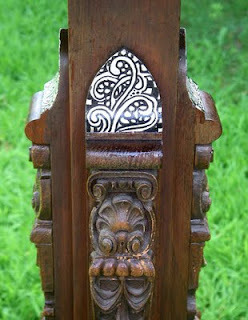 Here is a more detailed image of that beautifully carved bench that inspired assunta. 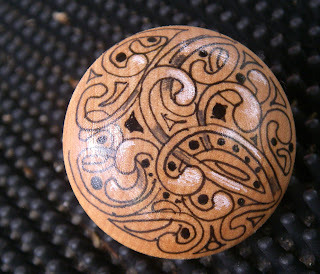 It's so beautiful and to think it was created 800-900 years ago, give or take a century. 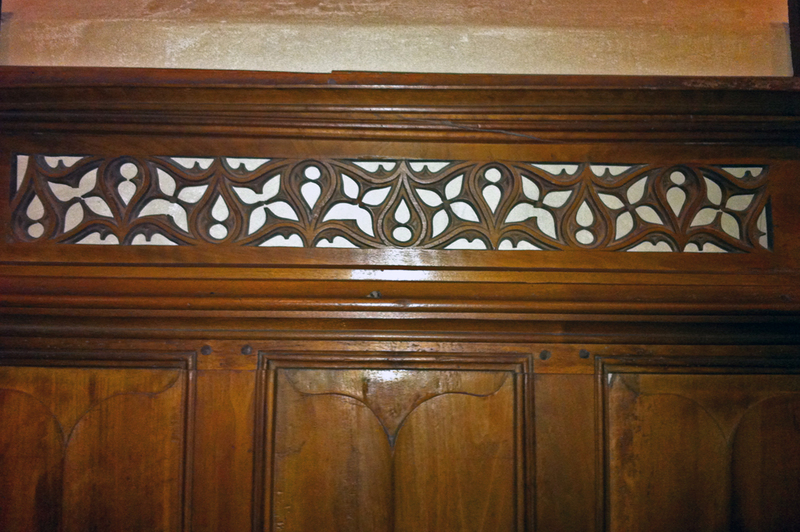 I wonder if this craftsperson used a 1/2 S-curve template to create the overall pattern . . . trace . 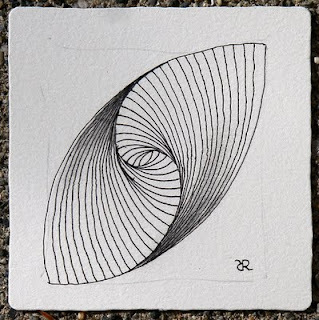 . . rotate, trace . . . flip, trace . . . rinse and repeat . . .
Click newsletter link to open this present and celebrate with us. 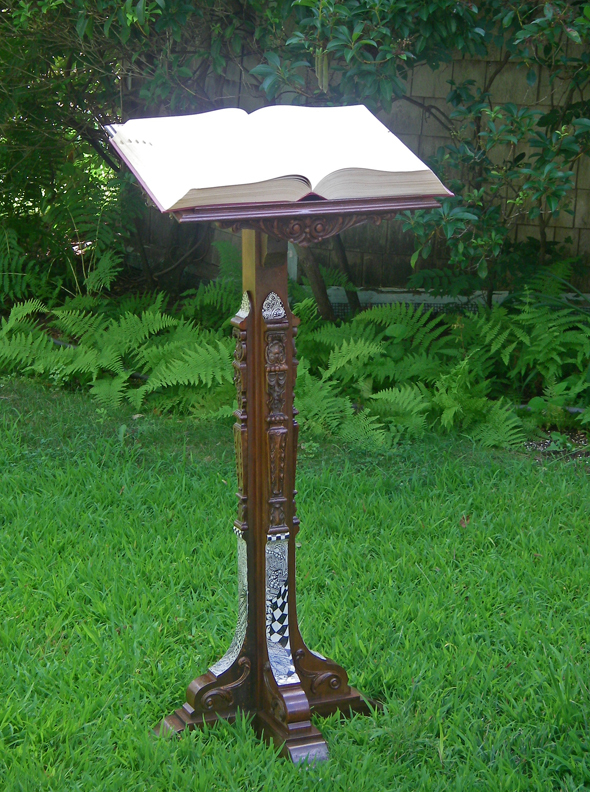 We keep our dictionary on an old book stand. We use it often. Recently, we moved it into a new room and it was in want of a fresh look. 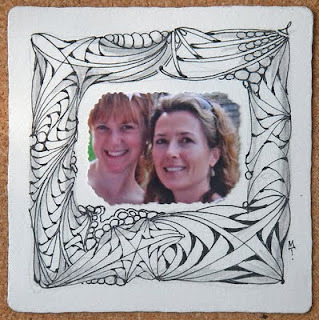 Maria got some gesso, a couple Sakura® Pigma Graphic 1's and . . .
. . . had so much fun! Click images for larger views of fun. Every now and then something simple and familiar makes itself known in a new and fresh way. I look at it in amazement and wonder why I never saw it that way, or in this case, why I never appreciated it in this way. Particularly when it's a simple insight that probably many others have seen, when the "aha" hits, it's both humbling and exhilarating. This morning I was reading Charles Hugh Smith's An Unconventional Guide to Investing in Troubled Times in which Charles quotes legendary trader Ed Seykota, "Whatever you put your mind to, whatever you expect, be it positive or negative, you tend to draw into your life." This is not a particularly new thought. But what struck me was Ed's use of "draw." Zentangle's slogan is "Anything is possible, one stroke at a time." And not to get all "pop psychology" on you, but you "draw" each stroke one at a time and Ed's use of "draw" as attract offered a wonderful (and obvious) parallel to that. I looked up "draw" on The Free Dictionary. Here are a few of their slightly edited definitions for "draw." Move in a given direction or to a given position, as by leading: The teacher drew the children into the room to see the decorations. Move or pull so as to cover or uncover something: draw the curtains. Take in (air, for example); inhale. Take or pull out: drew out a wallet. Extract or take for one's own use: draw strength from one's friends. Take in from a given group, type, or region: draw clients from all levels of society. Bring about deliberately; provoke: draw enemy fire; draw a penalty on an opponent. Use (a check, for example) when paying. Receive on a regular basis or at a specified time: draw a pension. Take or receive by chance: draw lots. To take (cards) from a dealer or central stack. Pull back the string of (a bow). 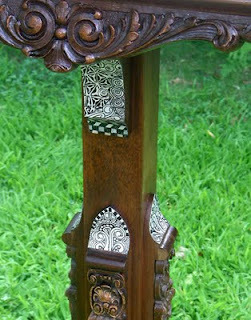 Flatten, stretch, or mold (metal) by hammering or die stamping. 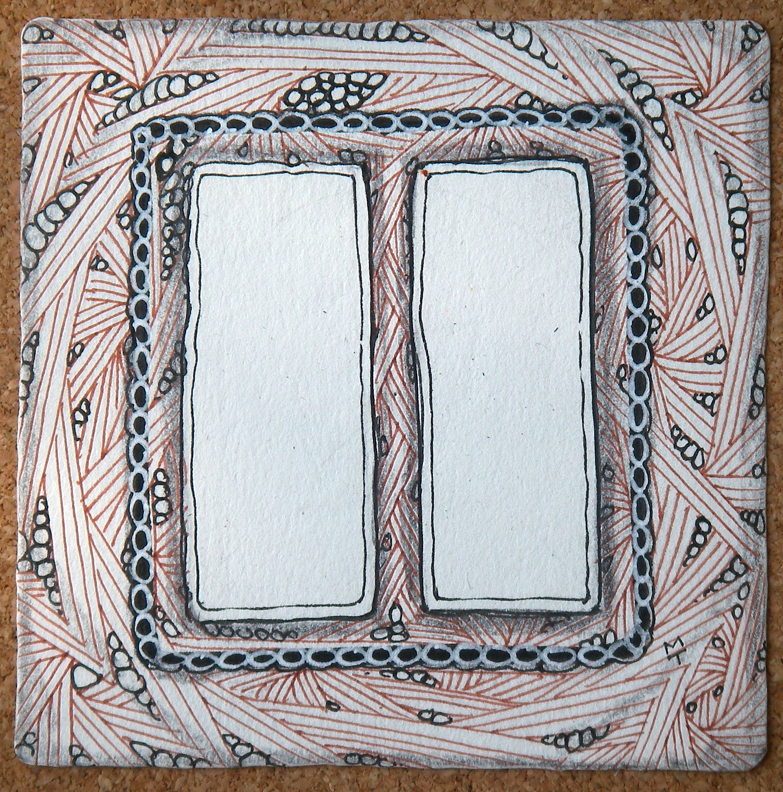 Shape or elongate (a wire, for example) by pulling through dies. 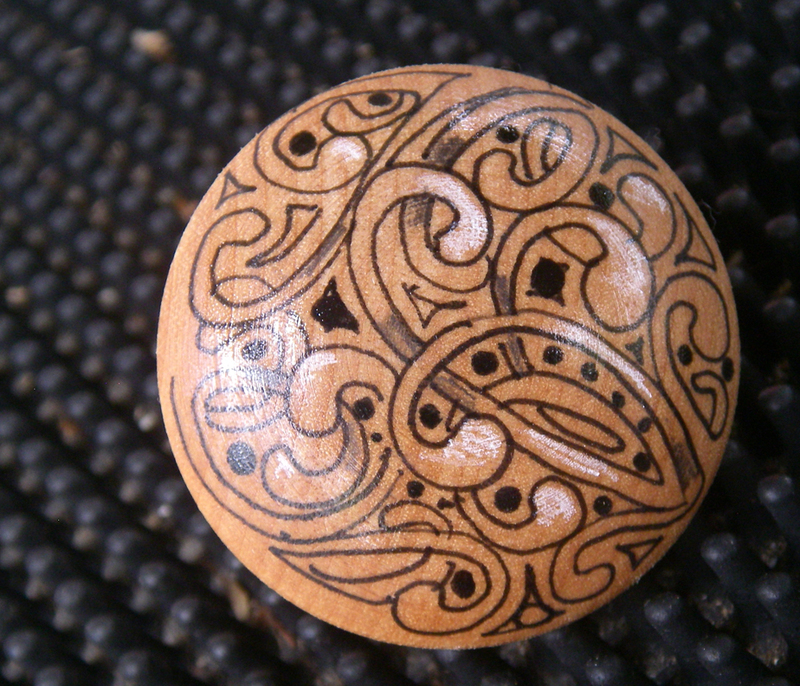 Inscribe (a line or lines) with a pencil or other marking implement. 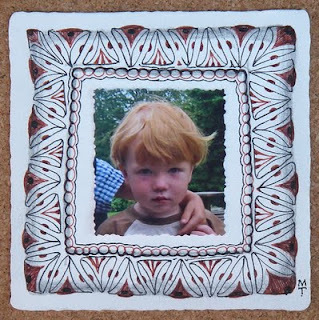 Make a likeness of on a surface, using mostly lines; depict with lines: drew a map of the area; drawing landscapes and still lifes. Formulate or devise from evidence or data at hand: draw a comparison. Compose or write out in legal format: draw a deed. Use or call upon part of a fund or supply: drawing on an account; drew from the experience of fellow workers. There are many more examples and definitions of "draw" on that page but I didn't include them all. I had to "draw the line" somewhere. This all just goes to underscore our personal ideas, that life really is an artform, and that everyone is an artist. 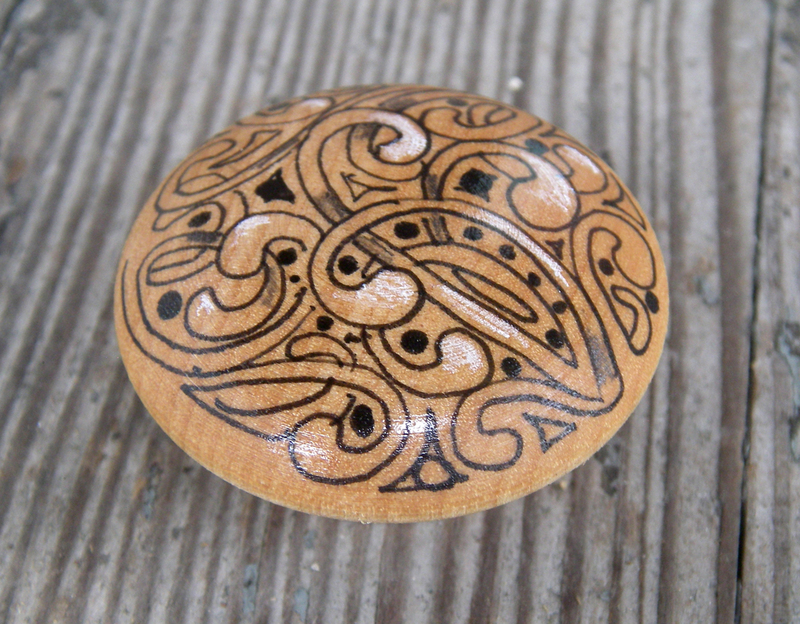 Maria came across a wooden drawer pull yesterday. Out came her black Sakura® Pigma Micron 01 and she tangled some mooka. She added pencil shading, white chalk highlighting and a couple coats of spray polyurethane. 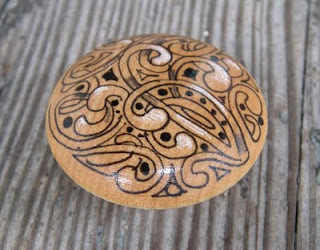 Now, we're looking at all the knobs in our home with a new perspective. And if we don't use it as a drawer pull, it still makes a great miniature lawn ornament! Maria was playing around with more "bordering" yesterday. 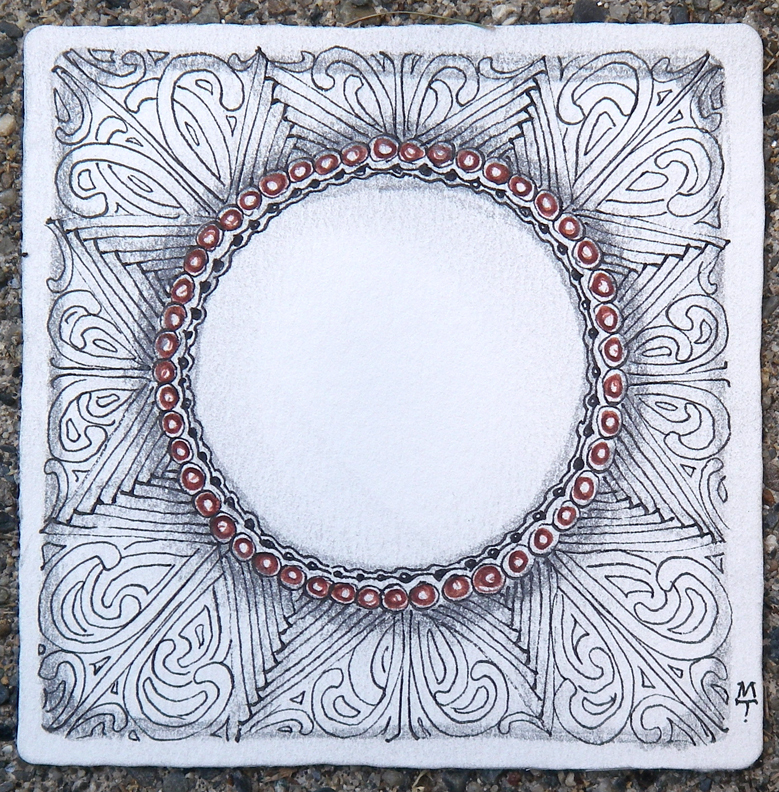 She was just about to put a picture in this Zentangle tile. I suggested we post it as it is. It's so bright and open to endless possible images. This is a lighthearted reminder that we each get to pick what goes into that space to focus on. We're focusing on what we want more of . 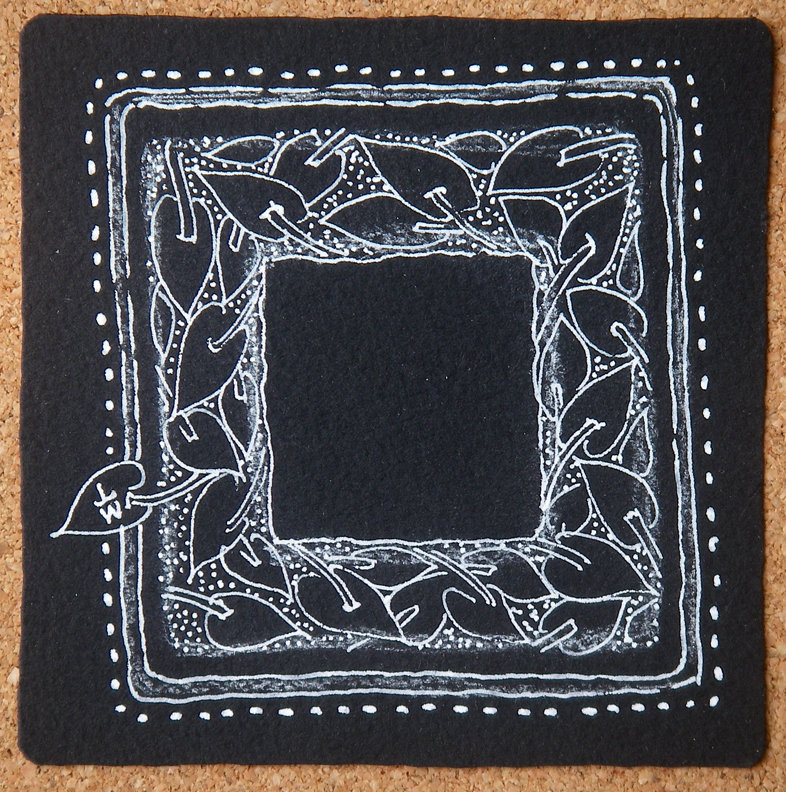 . . the wonderful people that Zentangle attracts, the wonderful feedback we receive, and how grateful we are to have met so many of you. Click image for larger view of possibilities. 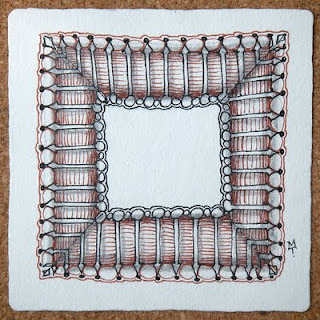 Some people think that if it's got an area with black lines in a pattern it's "a Zentangle." 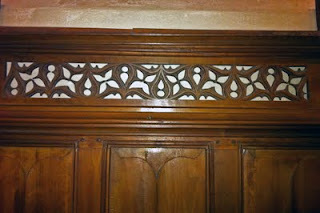 But filling an area with patterns is not new. 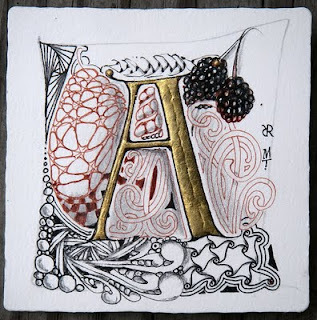 That concept is at least as old as illuminated letters on manuscripts from well before the 14th century. The Zentangle method is more than that. 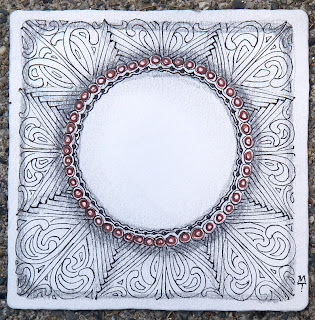 If you have taken a class with a Certified Zentangle Teacher (CZT) or have enjoyed our Zentangle Kit, you can appreciate this comparison. 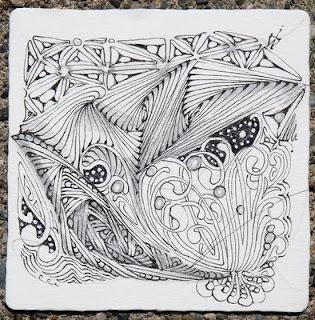 Think of "Zentangle" as an adjective to describe our teaching method and to describe art created and inspired by that method. 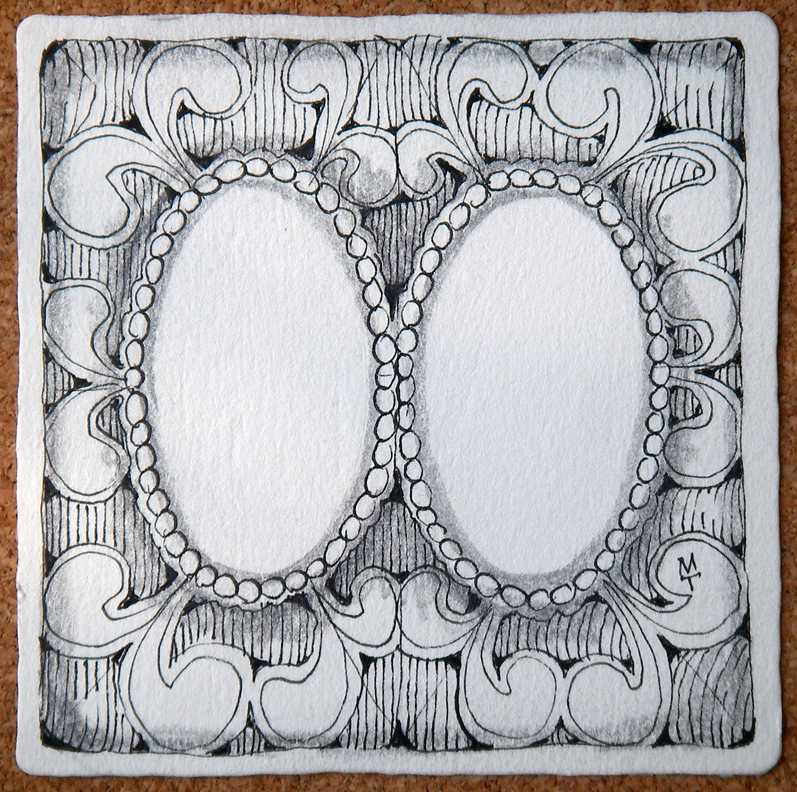 With Zentangle's process, we make no claim to any pattern or design. That is part of our shared human and natural heritage. 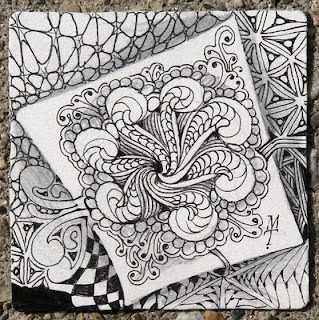 Our Zentangle contribution is a method that enables almost anyone - particularly people who think they "aren't artists" - to create beautiful images and feel good at the same time. As one person said, "This isn't art for the masses, it's art by the masses." 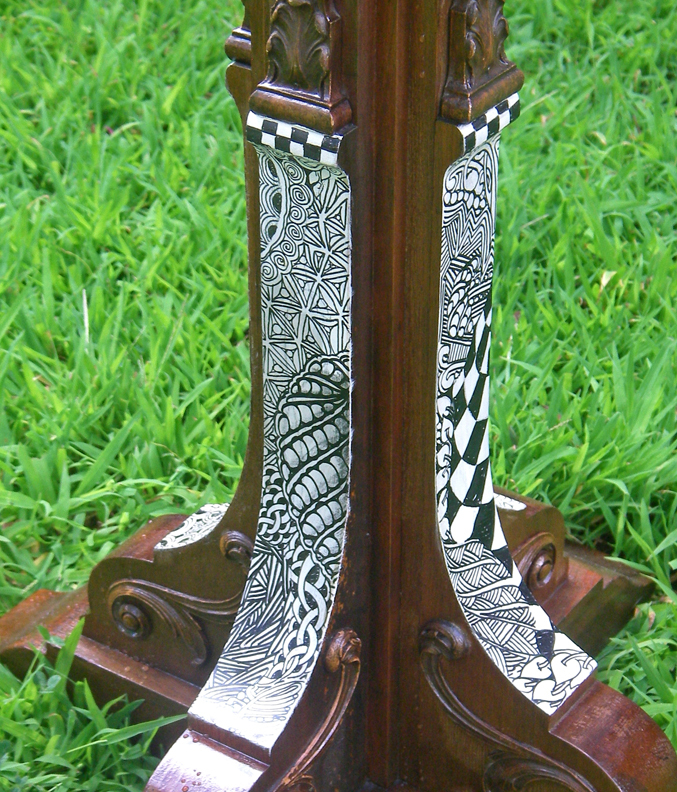 Maybe that is one reason behind the occasional strong reaction from a professional artist to Zentangle creations. An imperfect but useful analogy is Shin'ichi Suzuki's method for learning music. As we understand it, Mr. Suzuki believed that almost any child, even those who "aren't musical" can enjoy playing beautiful music. Mr. Suzuki never claimed a particular instrument or style of music as his invention even though he initially focused on classical violin. So, what inspired this post? We have to let you know that you were informed wrongly about the background of the art form you work with. 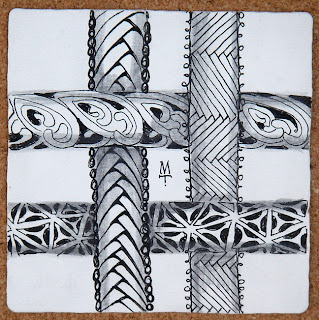 So-called "zentangle" is not "zentangle". This art form was originally created way back in 1989 by artist Nadia Russ (www.nadiaruss.com), who January 4, 2003 created a word NeoPopRealism and announced this new style of visual arts internationally. 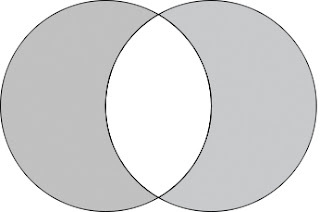 Right after that, some two people, who even not artists, came with new name to the same idea and concept. They simplified it because actually they couldn't draw, but wanted to sell Nadia Russ' idea. 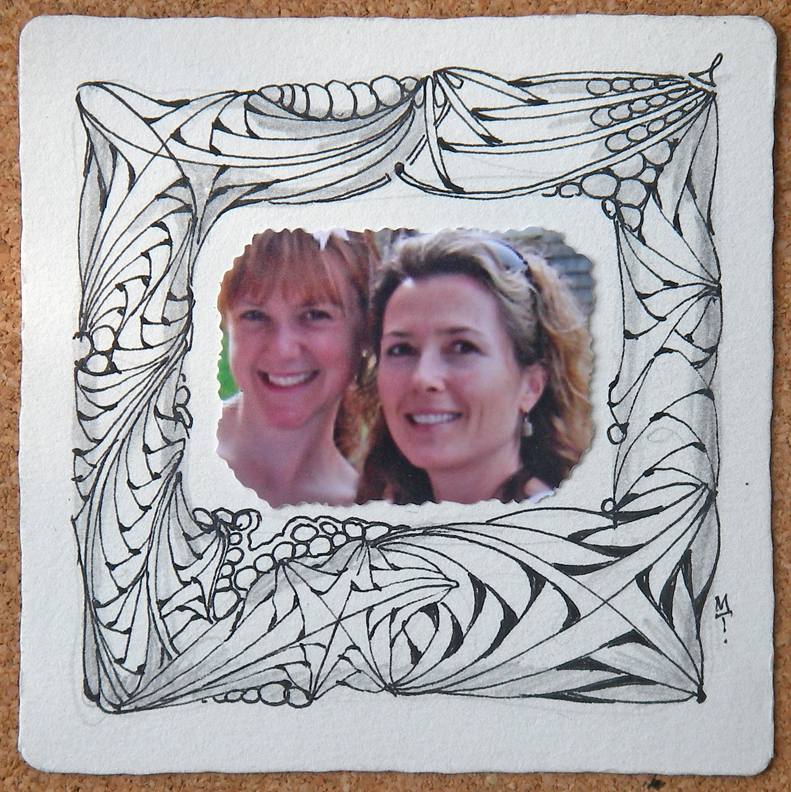 You know the rest with selling kits, etc from "zentangle" website and other sources. We don't know who's sending these emails because they're unsigned. But someone did send them and someone created a blog. It is our responsibility to our CZTs, to their clients and to our customers to provide information to allow each person to evaluate this situation and come to his or her own conclusions. We had not heard of Nadia Russ or seen her work until mid June of this year when someone sent similar emails to our CZTs. If your friends or customers receive an email on behalf of Nadia Russ, just refer them to this blog entry. If they still have it, please ask them to forward the email to us in case we need it later. We've reproduced the email in full below. Coincidentally, it also mentions that she "recently published" a book. We haven't seen it, but we trust that our publisher's staff will follow up on it as they see fit. Create your life as a great adventurous story. Egads, the hospital I teach at was sent this crazy email. I assume other CZT's got it but wanted to share it with you in case. I'm not planning on responding. Recently, NeoPopRealism creator Nadia Russ found out about new "inventors" of her style of the drawing and it was shocking news. 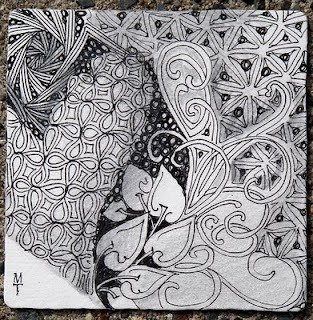 This is absolutely beautiful artistic style - drawing with ink pen using line and repetitive patterns while your mind is in state of meditation. 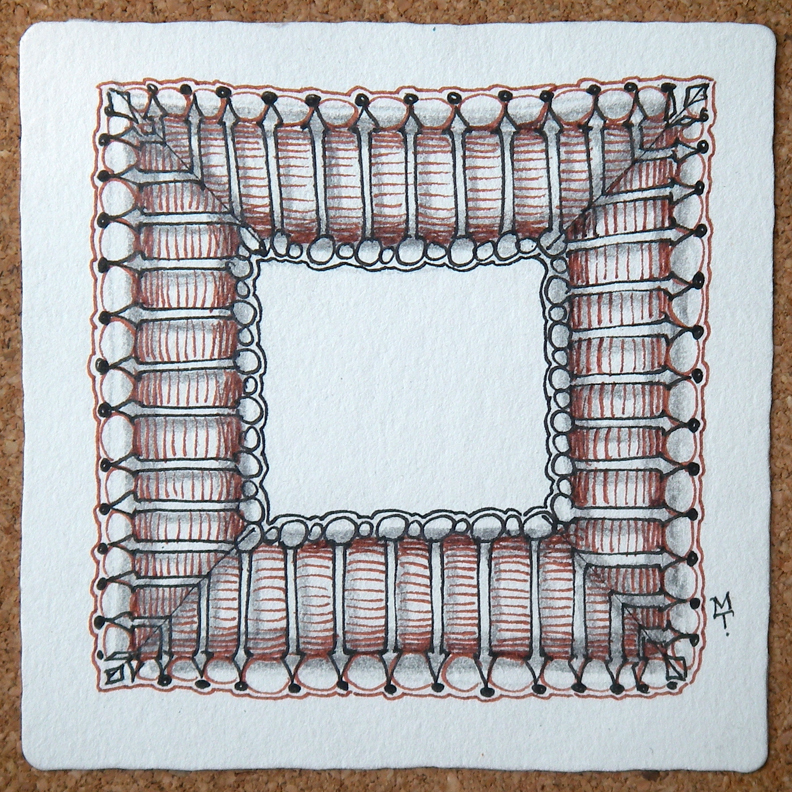 And no one should limit yourself to 3,5"x3,5"paper and Sakura pen. 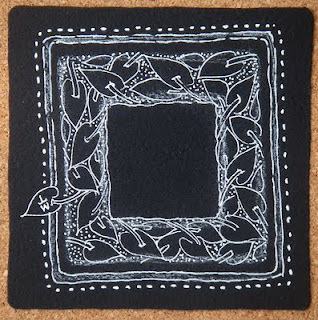 It will look great on every piece of paper and using any ink pen. 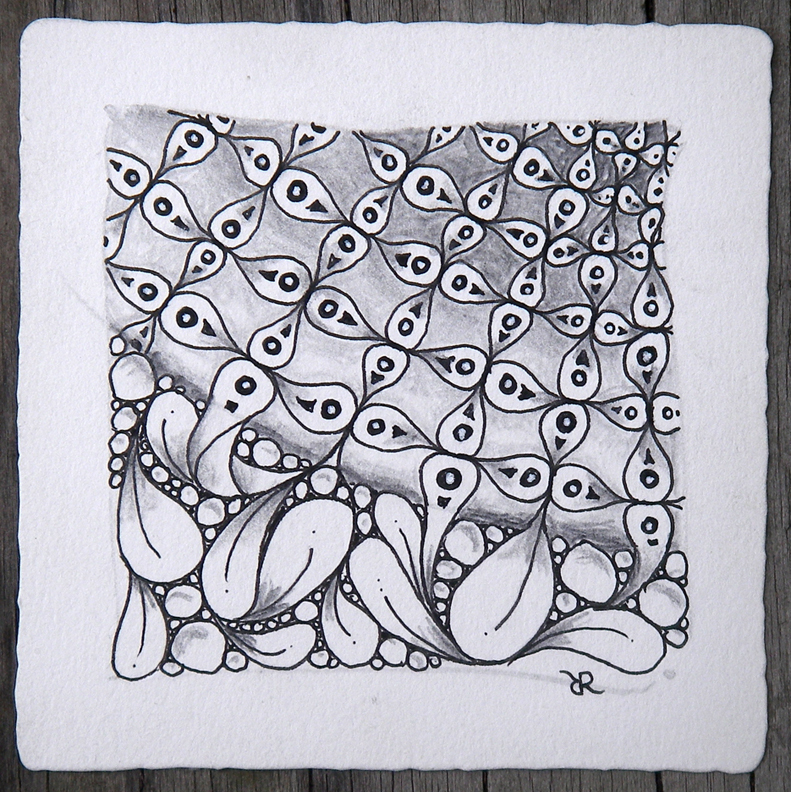 No limitations or restrictions should be to anyone who loves to draw and meditate! 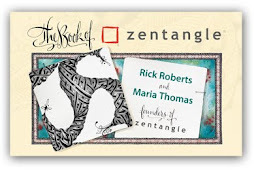 Rick Roberts and Maria Thomas state in they website that "Zentangle method and art form is copyrighted. It is absurdity, and there is no such registration inhttp://www.copyright.gov/records/website of the US Copyright Office. 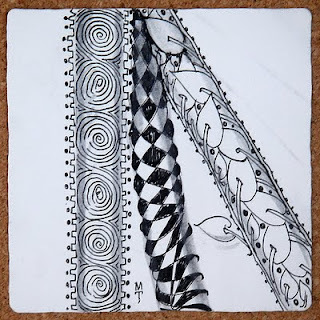 It can be checked in a minute just searching a word "zentangle". What Roberts and Thomas created is a word and trademark "zentangle" to re-name NeoPopRealism and sell it in their goods and teaching services. If you have questions, concern or just thoughts please contact us atneopoprealism1@yahoo.com(http://neopoprealismjournal.wetpaint.com). 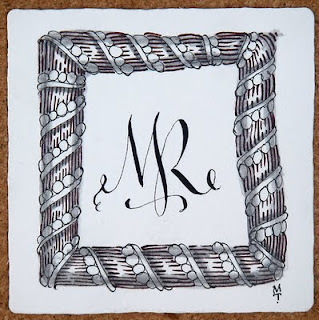 If you need any information about art style, its detailed history or would like to collaborate to develop your new projects and give some more information to your art lovers about art form they love, Nadia Russ will be happy to hear from you. Her contact information can be found inwww.nadiaruss.com, or email hernadiaruss@yahoo.com. 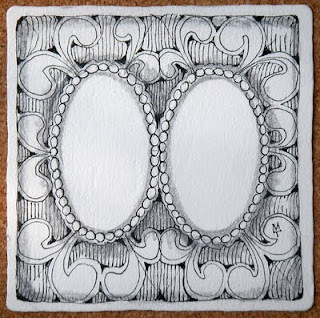 Originally, the concept of ink drawing without eraser, using line and repetitive patterns, was created in 1989 by artist NADIA RUSS, and in 2003 announced internationally as the NeoPopRealism style of visual arts. NeoPopRealism is New Style I developed and now present to the public. NeoPopRealism combines brightness and simplicity of Pop Art with deep philosophical Realism. 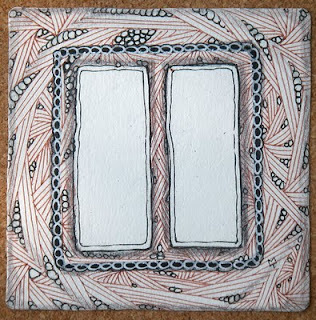 NeoPopRealism interested in whimsical contemporary world with its technological and cultural achievements, reflects psychological and social diversity. Lets look in past. 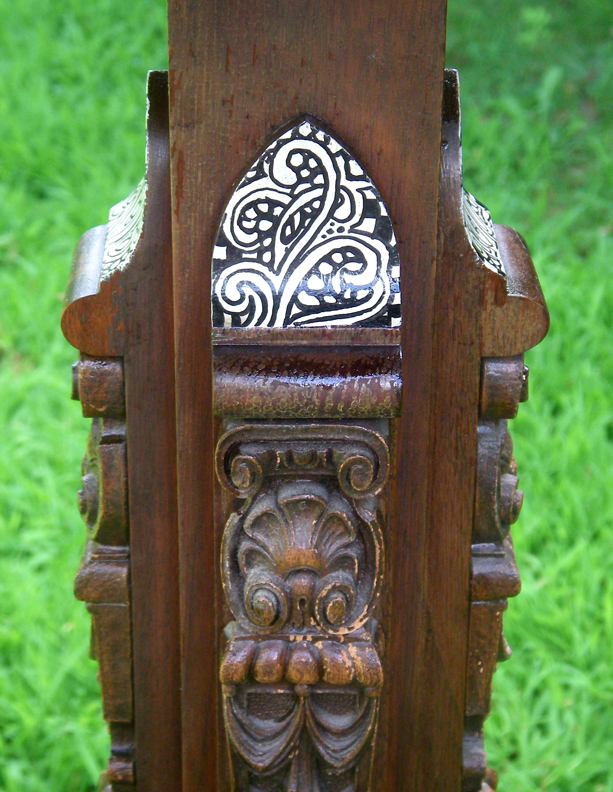 1900, the year when Plank came with his Quantum Theory; 1907, the year when Picasso presented to the world his cubism. In 1910 came futurism... New times bring new ideas. New millennium brought NeoPopRealism. This style carry bright color's energy and has graphic nature. Philosophical and whimsical same time. Subject - mostly Faces. How to paint in this new maner? I'll give more details and few lessons in near future. Welcome back. 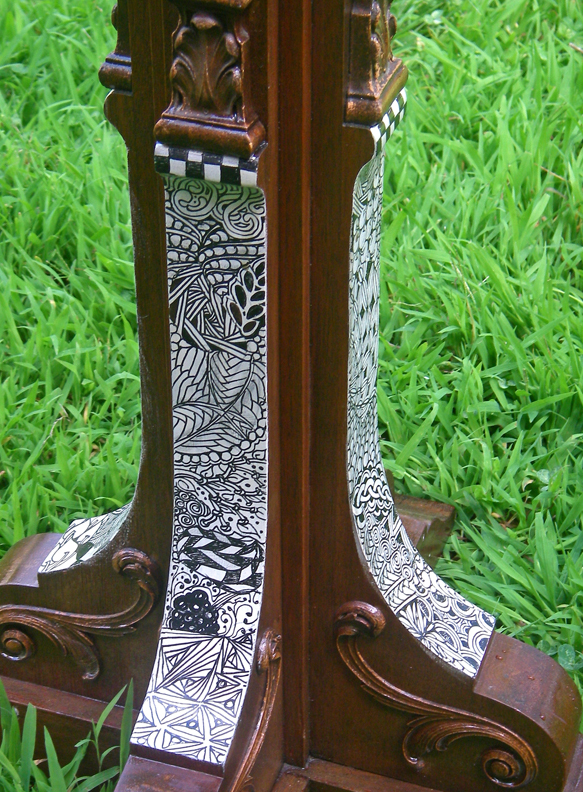 We are grateful for this opportunity to share what our Zentangle method and what Zentangle creations are all about. We had a wonderful conference call over the weekend. Here are Maria's. I've added my comments (shading) to her notes so you could appreciate the depth of what we discussed. It was an enjoyable and productive conversation. We published a new newsletter (and tangle) last night. Read it here.